6"/35 (15.2 cm) Pattern 1877. Note powder canister and bare feet. 6"/35 (15.2 cm) in casemate mounting. The built-up construction of this weapon is clearly evident in this sketch. The original design of this gun was by the Russian designer Brink in 1882. The barrel was made with a single tube on which 5 rows of rings were attached along with ashroud, connecting ring and mounting ring. The breech was the Trell de Bolue piston type. The first 18 guns were finished in 1887 and installed on the Black Sea battleships. In 1885 technology for making wire wound guns was purchased from England and in 1887 a wire-wound version of the 6"/35 (15.2 cm) gun was made. This had slight differences from the original gun and had a single tube with slightly larger fastening rings. Ten of these guns were made and installed on battleship Imperator Nikolay I and gunboats Otvazhny and Grozyaschii. 35 more guns were ordered, but in 1890 the order was replaced by guns made from two tubes of fastened type. The first of these guns was made in 1892. 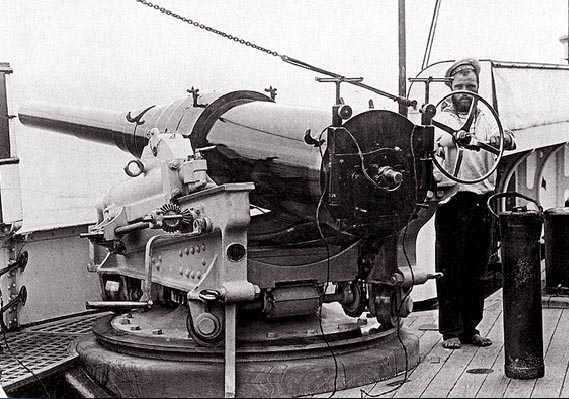 However, due to the development of the 6"/45 (15.2 cm) Pattern 1892, this order was cut to 18 guns. In 1904-05 nine guns of this type were installed on Amur River barges to defend against the possibility of a Japanese invasion. After the war the guns were removed and put back in storage. In 1913, 14 of the remaining 6"/35 (15.2 cm) guns were turned over to the army to be installed in the Sveaborg fortress, where one of them survives to this day.